This PI was superseded to update models, model years and add customer informationstatement. Please discard PIT5030D. Customers may comment on an intermittent no crank. The design of the key and fob isto have the key extended straight out. 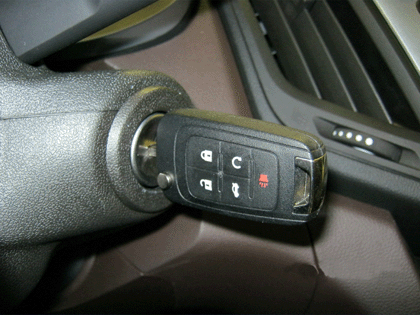 If the key is not in the fully locked positionand the head of the key is angled down, the vehicle may not crank. This may be causedby the customer contacting the release button on the fob when inserting the key intothe ignition. 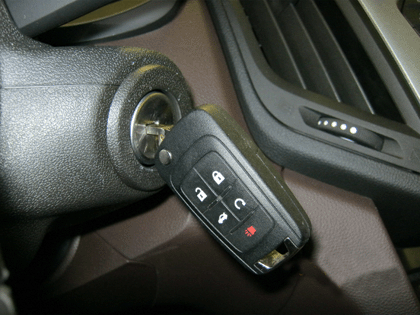 If the vehicle will not crank, remove the key and make sure it is fully extended.Reinsert the ignition key in the extended straight out position and turn to crankengine. Reference photos below. Note:This condition can set DTC B3055 (No Transponder or Modulation) in history. Clearthe B3055 from history and recheck keys that are learned to verify keys are operatingcorrectly. Please share this information with the customer. Please be sure to fully extend andlock the ignition key PRIOR to inserting the key into the ignition switch and attemptingto start the vehicle - as reflected in the photos above.